...are you have problems delivering? The Signature Technologies SA-2000 “SAM” module, and Signature Technologies “SamView™” software package can be used to monitor the flatness manufactured parts using the techniques below. 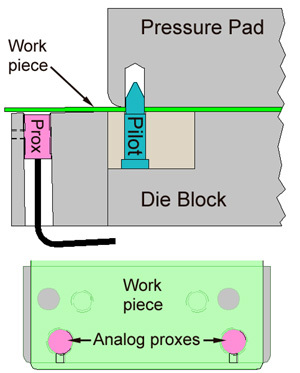 The system works by measuring the displacement of the flattened portion of the work piece relative to the dimensional sensor implanted into the forming die. Timing of the measurement is critical since the part must not be measured when it is being held in an abnormal position by the forming die. The part must be held in reference position both horizontally and vertically as shown, for example, by a pilot, and clamped vertically by a pressure pad. The area to be measured must be totally free and unrestrained by trim, or forming tooling when the measurement is made. 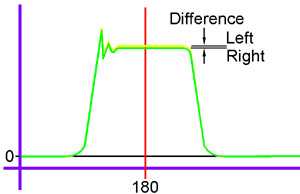 The measurement can either be calibrated, or comparative depending on the application. 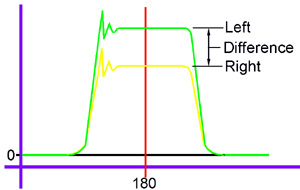 Calibrated measurements will give the dimensional variation at the sensing point. The signature to the right shows a seriously "Out of Flat" situation. Note the large difference from Left to Right. Multiple sensors can be used on wider work pieces to insure parallelism, or area flatness of the formed portion. The SAM™ module can handle inputs in groups of 8 up to 56 total points. If desired, Signature Technologies can provide controls to adjust the forming station(s) dynamically based on the dimensional measurements.